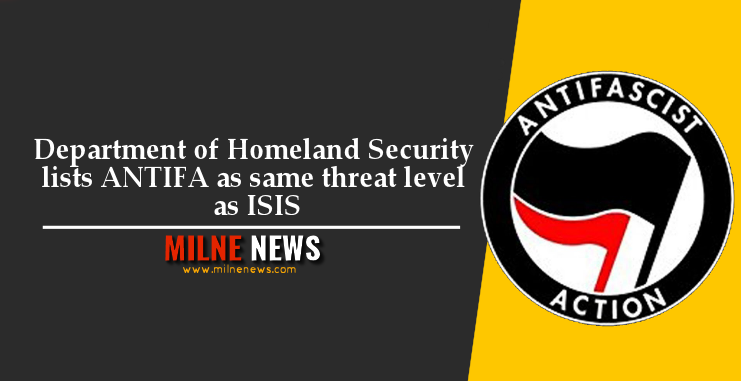 As reported by BigLeaguePolitics, A New Jersey state Department of Homeland Security unclassified report shows that they list Anarchist Extremists (Antifa) group as the same threat level as the terrorist organization ISIS. The Department of Homeland Security lists ANTIFA as a moderate threat, alongside militia extremists, sovereign citizen extremists, and white supremacist extremists. The only group seen as more of a threat is homegrown violent extremists. Homeland Security also list a number of violent events that were carried out by Antifa. They include a violent attack on a New York Republican club last year, and a violent racist attack against two Latino marines in Philadelphia. Following the “We the People” rally in Philadelphia in November, a group of individuals, including anarchist extremists, Maced, punched, and kicked US Marine Corps reservists not affiliated with the event while calling them “Nazis” and “white supremacists.” In October, anarchist extremists protested outside a Proud Boys event in New York City and engaged in acts of vandalism. After the event, one of the anarchist extremists threw a bottle at the Proud Boys, resulting in a fight.